As the faithful readers of the Blackwater Tactical Weekly know I once spent two weeks in New Orleans on contract to Blackwater. I’m home now and have had a couple of days to contemplate the gear I was issued to use while in N.O.. Certainly, the conditions varied from comfortable to, ah, less-than-comfortable, but the gear I was issued was sufficient to keep me at least able to survive. One of those items was a SnugPak Lite Sleeping Bag. Right on the stuff-sack itself it shows that the bag is rated to 32 degrees for comfortable sleeping, or down to 18 degrees for simple survival. The mere fact that the sleeping bag fit into a stuff-sack was a strength to me. When I was an MP I was issued a sleeping bag that, when rolled, was 20″(+) long and about 15″ across (at least). It was not a small package to pack and/or hump. The infantry was nice enough to issue me the same type of sleeping bag, but the NCOs readily informed me that I wasn’t expected to carry it. I was issued two ponchos (one to make a hooch and one to sleep under or wear) and two poncho liners (to be used for sleeping warmth). Of course, the motto “fight light, freeze at night” was a clear indicator that no one expected us to be comfortable when we slept. The Combat Engineers also issued me that same sleeping bag, but… they were nice enough to almost always give me a bunk to put it on. I got spoiled. So one of the issued items I received from Blackwater for New Orleans was the SnugPak Lite in Woodland Camo finish. SnugPak is a company located in the United Kingdom that makes a host of outdoor supplies. The SnugPak Sleeper Lite convinced me that they know what they’re doing. 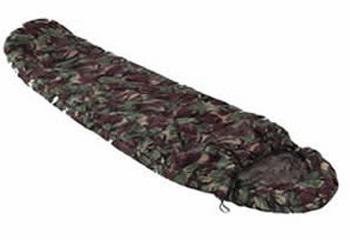 The sleeping bag measures 87″ long according to the tag on it, but the online published info says it’s 86″. I’m 5’10” tall and either one would be fine with me. Since all sleeping bags are soft and move easily, measuring it precisely is a difficult proposition. It was MORE than big enough for me. More measurements: the tag says it’s 32″ across the shoulders and 24″ across the feet. Online says it’s 65″ around the chest – which is within an inch of what you get if you double the width measurement. Including the stuff sack itself, the package weighs 3.5 pounds. Although I’ve never realized a difference between right handed or left handed sleeping bags, SnugPak advertises their Sleeper Lite bag in both. Mine is right handed which means the zipper runs the length of the right side. The bag is what I’ve always known as a “mummy bag” with an extension to wrap around your head. There is a draw string that encircles that space so that you can draw the hood section tight and leave only your face exposed. I had no need of that. The time I spent in tents saw overnight temps in the low- to mid-eighties. My sleeping bag was used more as a pillow than for warmth. However, there was one night that the temps dipped slightly lower and we all got our wishes for a breeze. I was happy to have the sleeping bag to slide into – although I didn’t need to zip it up. I don’t know what else to say about this bag. Packed into a stuff sack that measures 16″ long by 8″ across, it’s a nice handy package. You don’t have to roll the bag to get it in. Just start stuffing. Guess that’s why it’s called a stuff sack, eh? I’ve found these sleeping bags being sold online for as little as $68 in olive drab. Woodland camo the cheapest price I found was $93. Still, those are good prices for such an efficient sleeping bag in such a space-efficient package. Mine is cleaned, stuffed and strapped to the bottom of my three-day pack (a BlackHawk HydraStorm Force 5). Next time I go out for the weekend in the woods, for sure this is what I’ll be sleeping in.